Let’s turn our attention to the TV questions that are plaguing me this week. Is Jayma Mays the mother on How I Met Your Mother? At first, I was very excited about last night’s How I Met Your Mother. “Jayma Mays is the Mother!” I thought to myself. That euphoria lasted about five minutes before I realized that it is much more likely that Coat Check Girl as the possible mother is yet another bait and switch the comedy is pulling on its viewers. Ted said he would have run to go see his future wife but really that could be anyone. Besides, it would be a little confusing if the Mother we’ve been hearing about for eight seasons turned out to be Mr. Schu’s estranged fiancée. There are plenty of actresses out there and I hope that How I Met Your Mother picks a less than familiar face to play the title role. But mostly I hope we find out who the Mother is before the end of the season. I’ve looooong contended that the show was a strong enough comedy by itself and that it no longer needed the conceit of the title to keep viewers interested. Now, it’s more than a little annoying that the series keeps dragging out the big reveal. 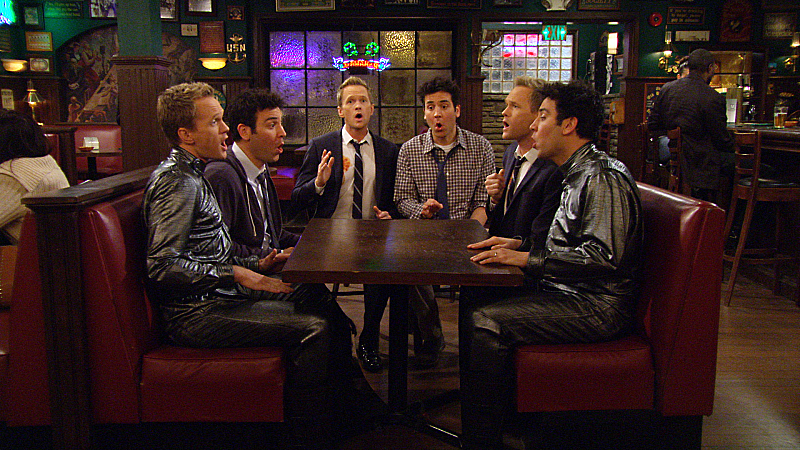 On a much lighter note, Ted, Barney, 20-years-from-now Barney, 20-years-from-now Ted, 20-minutes-from-now Barney and 20-minutes-from-now Ted singing “The Longest Time” is definitely one of my favorite How I Met Your Mother moments EVER. Is Alicia truly in love with Peter on The Good Wife? On Sunday’s The Good Wife (you can read my review of the episode here), Alicia had a heartfelt conversation with her daughter where she told Grace she was with Peter because she loves him. But I couldn’t tell if she was just telling Grace what Grace needed to hear. I believe Alicia loves Peter – they have a history and two children together. And clearly she’s still attracted to him. But is she still in love with him? I’m not so sure. There’s been a shift in the power dynamics and the way Alicia has treated Peter this season. She has the upper hand in their relationship (he needs her more than she needs him) and often it seemed like she was using their little afternoon delights to show who had the true power in their relationship (she even laughed at Peter when he said he wanted to take her out on a date). Yes Alicia has used Peter’s political position to advance her career this season but I don’t think that’s why she is staying with him. She knows how much it would disrupt her children’s lives if she divorced Peter and pursued her relationship with Will. And it’s hard to let go of her relationship with Peter and the family they have together. What do you think? Will Jess and Nick hooking up ruin New Girl? No, it will not. Plenty of comedies put their will-they-or-won’t-they couples together and it benefits the show – Pam and Jim on The Office, Sabrina and Jimmy on Raising Hope to name a few. It would be far more unrealistic if these two people, who live together and are clearly attracted to one another, did nothing about it for two years. The problem is that Nick does not have his life together – at all. He needs to figure his own stuff out before he can truly pursue a relationship. The trick will be to not make Jess and Nick like Ross and Rachel on Friends – that dragged on for way too long. Let Schmidt and CeCe be the Ross and Rachel. Nick and Jess can be the Chandler and Monica. Does anything on Glee make sense anymore? No, it does not. Santana and Quinn hook up? The show doesn’t have Quinn on all season and then brings her back just to fulfill a male fantasy cliché? Really Glee? Really? And it’s not like Brody was this great character, but a male gigolo? Really Glee? Really? Nothing about the characters is consistent. This has always been Glee’s Achilles’ heel. But this season the characters have been out of control. As we’ve previously discussed, witness Tina’s crush on Blaine, Blaine’s crush on Sam, and the aforementioned Quinn/Santana hook up. And the story lines are so erratic. Rachael could be pregnant! No she’s not! And I’m wondering – is there another Glee that regularly features Sugar, Joe, Kate Hudson, and Sarah Jessica Parker? Not that Sarah Jessica Parker’s character ever made sense, but way too many characters have disappeared this season sans explanation. I still love the musical numbers. Seriously there’s not a better way to my heart than an ‘NSYNC/ Backstreet Boys mash up. At this point, the series should be a musical revue show with no dialogue and no plot. What are your thoughts on How I Met Your Mother, The Good Wife, New Girl, and Glee? Talk about it below. This entry was posted in Glee, How I Met Your Mother, New Girl, The Good Wife by TV Gal. Bookmark the permalink. I agree wholeheartedly on Glee. I watch only for the musical numbers. Seriously, I didn’t even know that Quinn and Santana hooked up. Where was I? Oh, yeah, chasing after a two-year-old. He only likes the musical numbers, too. I thought the same thing about the mother being sick/gone on HIMYM…and I didn’t like how that (possible) plot line came out of nowhere! If that is the final note the series is headed towards, I will be quite disappointed! I was getting the same feeling by the way Ted was talking that the mother is no longer alive. Or a really big twist would be that Ted is dead and the kids have been watching a video all along that he had left them. I feel like Alicia has fallen back in love with Peter. Like she told Will she hasn’t been able to move on and I feel like now she has. After he punched Matthew Perry and everything with Grace I feel like she trusts him again and would consider reconciliation. But who knows. I don’t think the show would have Peter cheat or betray her in any way now moving forward. After the whole Kalinda thing, it would just be too much of a blow.